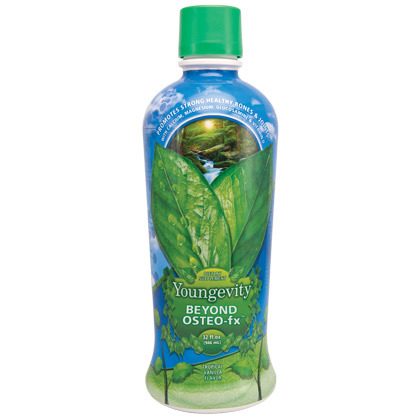 Beyond -fx Osteo liquid was formulated to help support optimal bone and joint health.Beyond -fx Osteo liquid can be easily added to your favorite through its new drink easily consumable form. With more than the recommended amount of calcium and nutrients needed to enhance calcium absorption by the body -fx Beyond Osteo powder provides optimal bone and joint health support daily intake. 32 fl oz jar. Directions: Adults mix a rounded tablespoon water or juice per 100 pounds of body weight one to two times a day. Children daily about ½ tablespoon per 20 pounds of body weight. should not exceed one tablespoon. Vitamin D3, Calcium, Phosphorus, Magnesium, Zinc, Copper, MSM, Glucosamine Sulfate KCI, Boron, Strontium, Plant mineral derived complex, inulin, fructose, citrus peel extract, citric acid, natural flavors, stevia, natural color, sunflower EFA, guar gum. The NSF mark is your assurance that the product has been tested by one of the most respected independent certification organizations in existence today. It is valued by consumers, manufacturers, retailers and regulatory agencies worldwide. NSF certification mark on a product means that the product meets all requirements of the standard. NSF performs periodic unannounced inspections and product testing to verify that the product continues to comply with the standard. About NSF: http://www.nsf.org/about-nsf/nsf-mark/.